In the battle for eyeball, no front is left unmanned, no stone unturned, no Stairs and Escalator ignored… . Yes, no Stairs and Escalator ignored. Since you barely doing nothing when you walking on stairs and especially standing on escalator, why not let you watch some advertisement. 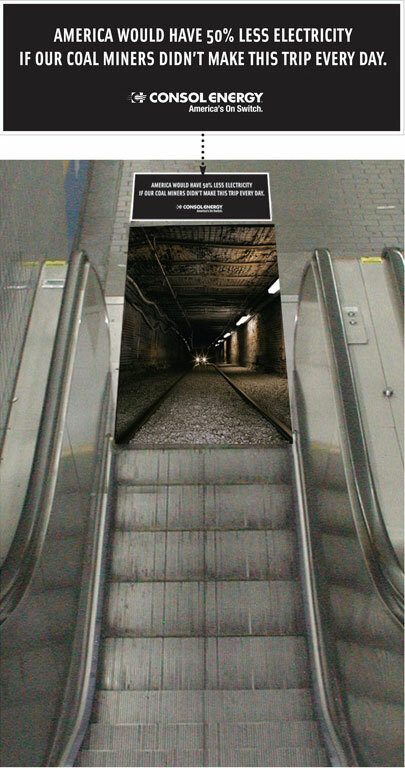 Guess due to that reason, I found lots of ads on stairs and escalator, some of them are pretty smart. 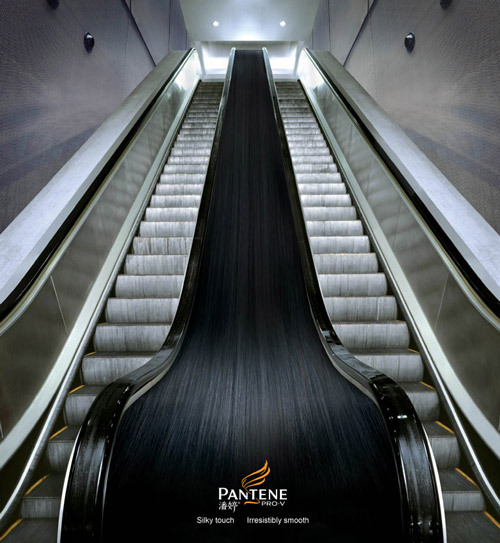 So are you ready for our today’s topic, 15 Creative Advertisement on Stairs and Escalator. 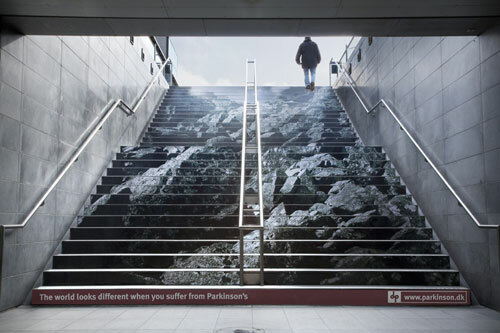 This is an awesome ads on stairs. To utilize the store’s main staircase in a creative way by presenting it as a chest of drawers, with everything inside neatly organised, highlighting the efficient use of space in an impactful way. 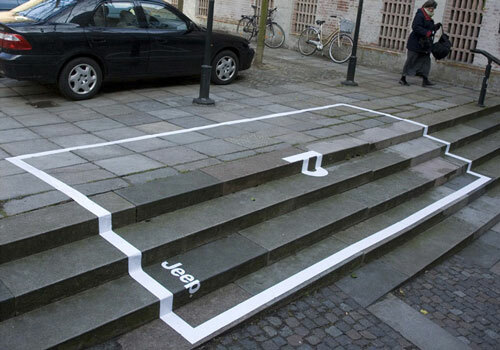 Jeep: Parking Space was to make the Jeep brand part of the urban environment in a surprising way. It is a nice idea. Just concerned about the negative influence people saw that…since I will be annoyed when I saw people park like that…. To demonstrate the experience of Ogawa’s first-class massage in a unique way, life-sized stickers that were strategically placed at selected stairways around the city to promote the Ogawa experience. Whenever someone treads across the sticker, it creates an illusion that the printed figure on the sticker is enjoying an Ashiatsu “foot” massage. Life comes at you fast. 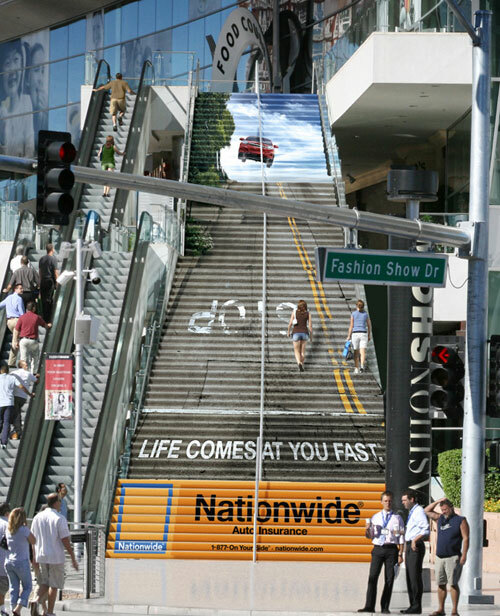 Nationwide Auto Insurance. You cannot imagine what it’s like to compete everyday of your life. Sponsor handicapped athietes. Bring to life the smooth shave benefit of Gilette Venus in a unique way, using ambient as the medium. 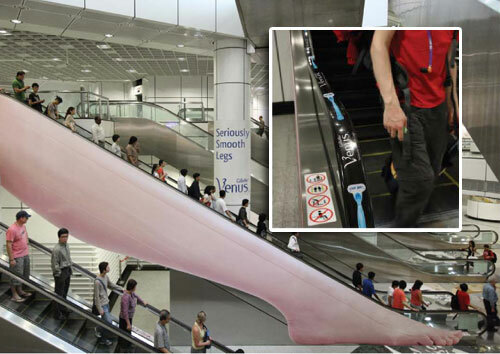 They built and installed a smooth giant leg in one of the busiest MRT stations in Singapore. 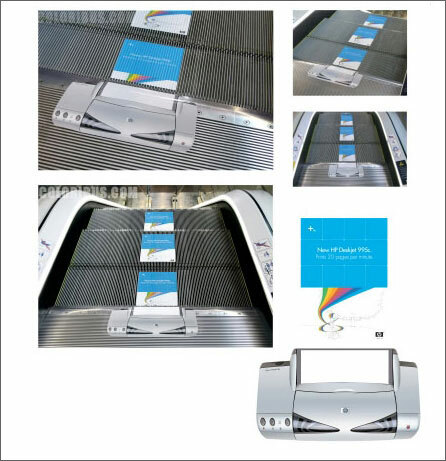 Daily commuters in the country largest MRT station saw the installation which gave the illusion that people holding the handrail were running there hands down the smooth leg, while the product was revealed on the handrail itself and on the banners nearby. 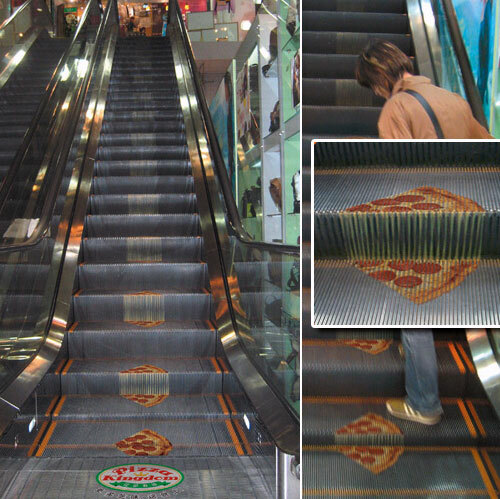 Escalator in front of the Pizza Kingdom restaurant was creatively used to advertise their new pizza with more cheese. Want extra cheese pizza? Just get over here! 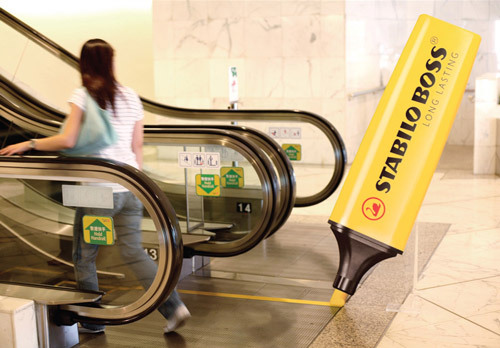 To capture the long-lasting ability of Stabilo highlighters, giant pens were installed at the beginning of escalators throughout Hong Kong. As the steps continually moved forwards, the pen appeared to create the bright yellow safety marks on the side of the steps – non-stop from morning to night. Nice advertising idea for the sushi restaurant Sushi Roll at the point of sale. 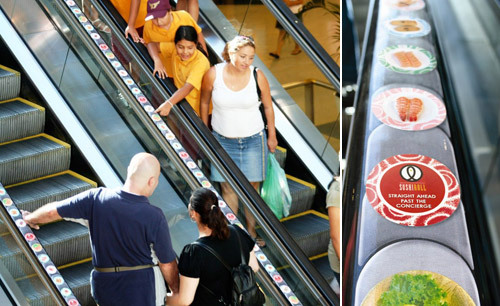 Stickers of sushi meals were bonded at the handrails of an escalator. Inexpensive realisation with a great effect. 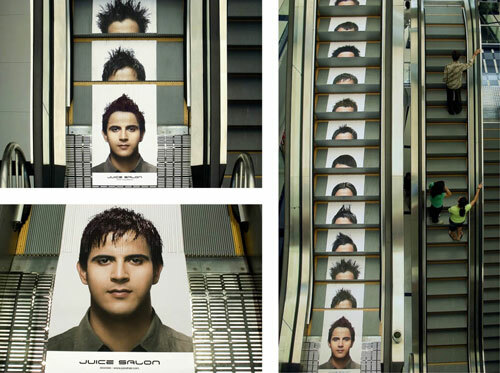 To advertise the wide variety of hairstyling options available at Juice Salon, a picture of man up to his forehead was pasted on the base of the escalator and a different hairstyle on each of its steps. As each step of the escalator moved down, it resulted in showcasing of a different hairstyle. America would have 50% less electricity if our coal miners didn’t make this trip every day. Consol Energy. America’s On Switch. 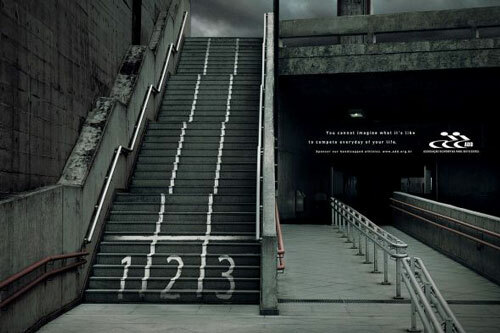 To encourage people to take the stairs instead of the escalator, regular stairs at the Odenplan subway station in Stockholm were turned into piano keys. 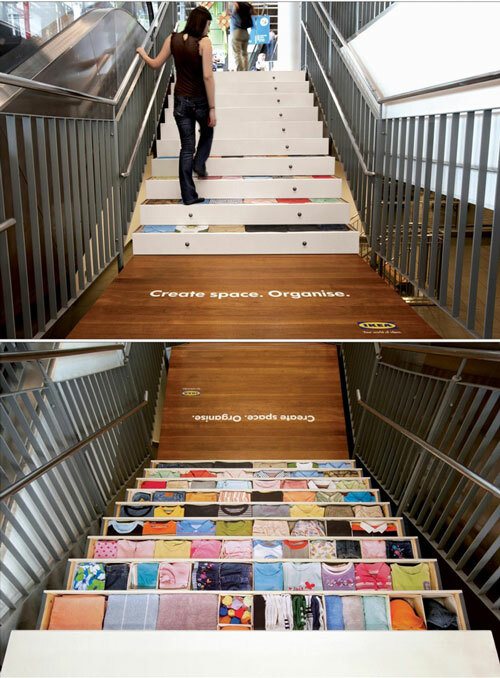 You can make your own songs when you climb the stairs !! !